Haven’t decided on a hotel yet? You can look at other available hotels in the Connaught region with Booking.com. 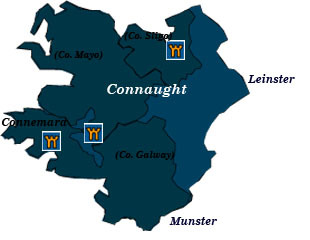 The ancient Celtic province of Connaught is the least populated region of Ireland. Here, too, Gaelic culture is alive and well, and it’s not unusual to hear Irish spoken in the streets. The lush landscape of Counties Sligo and Mayo, the mysterious and lonely valleys, rugged coastline, and windswept mountains of Connemara have inspired poets and writers. You can’t help but feel an undeniable magic in the air. While traveling about Ireland, and especially Galway, be on the lookout for Irish tower houses. In the Middle Ages, local chieftains built these fortified residences to provide protection for their families. Some 3000 tower houses exist in Ireland. Each of the atmospheric castle hotels in the Connaught region makes a perfect base from which to explore the area, or to try out a day of fishing, horseback riding, or golfing. Connemara Quiet, glacial lakes, lofty mountains, rugged coastline, bogs, unusual plants and abundant wildlife distinguish this desolate and magical area of Ireland. Hikers can take advantage of numerous trails in the Connemara National Park. Kylemore Abbey Originally built as a private home in the mid-19th century, this Gothic Revival stone-turreted castle became an abbey when Benedictine nuns living in Belgium took refuge here during WWI. Presently a girls’ boarding school (the school is due to close in 2010), guests are welcome to visit part of the abbey. Aughnanure Castle The “Fighting O’Flaherty” clan built this fine example of a six-story tower house in the 16th century on a rocky island on the River Drimneen. Aran Islands The three islands of Inishmore, Inishmaan, and Inisheer attract visitors with its austere landscape, 2000-year-old stone forts of Dún Aonghasa and Dún Duchathair, and a glimpse of traditional Irish culture. Croagh Patrick One of the best known landmarks of County Mayo, this holy mountain (765 m.) is named after Saint Patrick who spent 40 days on the top fasting and praying. 25,000 pilgrims a year make the trek to the top where the views are wonderful. Nearby, the town of Westport was named in 2004 as the tidiest town in Ireland. A drive through Yeats country You don’t have to be a fan of W.B. Yeats to appreciate the peaceful lakes, rivers, and forests that inspired his poetry. Carrowmore Megalithic Cemetery, filled with dolmens, stone circles, and tombs, is one of the largest Stone Age cemeteries in Europe. Shrouded in myth, Knocknarea Cairn is thought to be the resting place of the legendary Queen Maeve. Also dating back to the Stone Age is the Carrowkeel Passage Tomb Cemetery, marked by dolmens, cairns, and chamber grave. Strokestown Park House and Famine Museum (County Roscommon) King Charles II of England granted this once extensive estate to Nicholas Mahon for his support during the English Civil War. In the 18th century Mahon’s grandson built a grand Palladian-style mansion, which can now be visited by guided tour. In the former stable yards, the Famine Museum tells the story of how the Great Famine of the 1840s impacted the local peasantry, who were sometimes forced into death ships to North America.